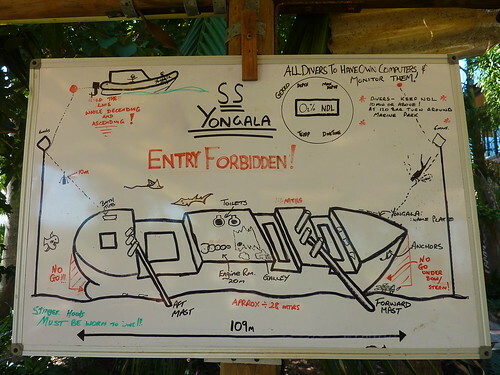 The SS Yongala was recommended to us by Roxanne, a keen diver we met on Rabbit Island in Kep. The Yongala was a passenger ship which got hit by a cyclone between Melbourne and Cairns in 1911 (the year before the Titanic sank) and ended up at the bottom of the sea just south of Townsville, killing all 122 people on board. It cost £102,000 to build at the time, which these days would barely get you a council flat in Bristol. A century on, and it is one of the world's most intact shipwrecks hosting a diverse variety of marine life and penetration diving is still forbidden. Getting to the wreck was done via a small catamaran, over some exceptionally rough seas. If you have any predisposition to seasickness, you will definitely get hit with it on the way to the dive spot. 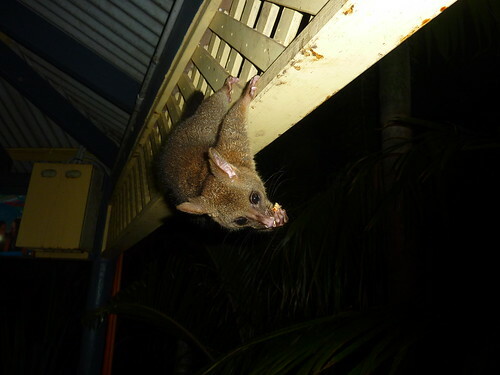 Having said that, it is far preferable to leave from Ayr than Townsville. We went with a company called Dive Yongala based in Ayr, and the journey was around 30 minutes. The same stomach-clenching journey from Townsville will take you the best part of two and a half hours, and I can only thank TripAdvisor reviews for alerting me to the options otherwise I doubt either of us would have been in a state to dive by the time we arrived. On the first dive, the seasickness and head-high waves must have been too much for one of the other girls diving, as she had a panic attack just before descending and had to be brought back to the boat. Since we only had two dives on the trip, it's not a position you want to find yourself in. It's a shame you don't get three dives, as there is lots to see around the ship. We ran into some stunning Kingfish (giant trevally), a loggerhead turtle and two huge marble rays on the first dive. It was the closest I've ever been to a big ray and the spotted colouring was superb. They glided effortlessly through the water, their entire bodies shimmering. It was like watching a piece of silk gently floating along. On the second dive we were lucky enough to catch a glimpse of a bull shark just before we were about to ascend. These are one of only a few species of shark that are actively aggressive towards humans (the tiger shark and great white being the other two). It was heading in the other direction, fortunately! I enjoyed the Yongala dive more than the Great Barrier Reef dives in some respects. There seemed to be a lot more variety in sea life, and the wreck itself was really interesting. I even got to hold the ship's wheel, which was exposed to the elements, and we got to see inside the kitchen and bathroom areas as the ship is on its side in a 45 degree list against the ocean floor. It was definitely the best wreck I've ever dived, but we could definitely have done with a third dive, given the relatively expensive cost of the trip. 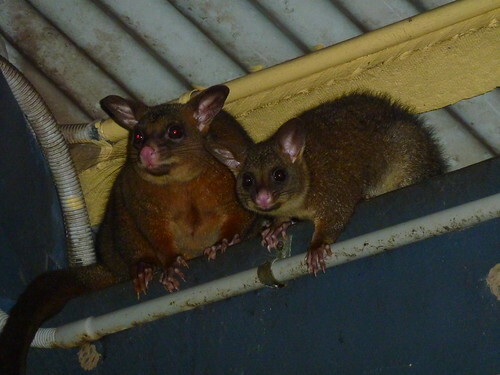 We drove to Flametree Park in Airlie Beach in the evening, where a couple of possums kept a watchful eye on how much food we were leaving. 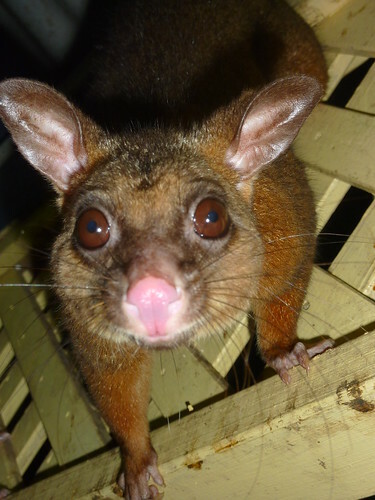 I fed one of them a bit of chilli cheese which probably didn't agree with it too well, as a couple of minutes later it left us a "present" all over the table. I guess spicy food doesn't really agree with them. In the morning, we took a trip down to the beach proper, which was no great shakes as beaches go. 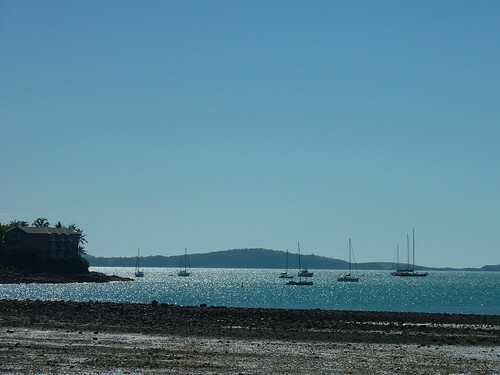 Hundreds of yachts lined the harbour; Airlie Beach is the main jump-off point for cruises around the Whitsundays. We had a walk around the town and I sold a couple of books before the four of us went to look at the options for a 2 day cruise. 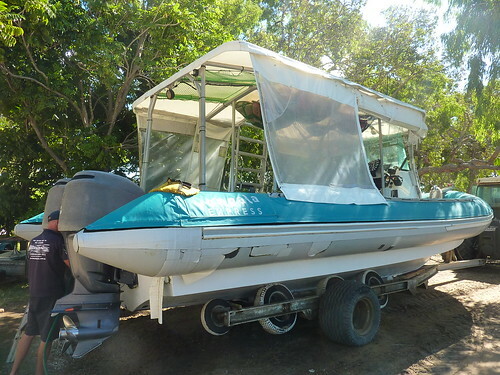 We were in luck - a boat called Hammer was short of people, and we managed to negotiate a good deal with Airlie Beach Backpackers which allowed us to keep our vans in their secure car park, and they would let us use the showers when we returned (their are none on board the boat). On top of this, they offered a free night's accommodation - Gilly stepped up and asked for the cash alternative instead since we had vans, and they duly agreed! The Whitsundays were supposed to be one of the nicest places in the world to take a boat around, and we were also looking forward to Whitehaven beach - consistently included in lists of the top beaches in the world. Day 207 - 208: The Whitsundays - Hammer Time!